Slime mould Stemonitis fusca in Scotland. Slime moulds, or slime molds, are forms of life which live on the rainforest floor, and many other parts of the world. They slither over ground and fallen tree trunks in search of food. They scatter spores, like plants, which grow into new slime moulds. They are a way of life, or life-form, which has evolved a number of times. Because they are not a monophyletic group, they are put into several different phyla. They have some features of fungi and some features of protozoa. This was discussed by Anton de Bary in 1858. They spend part of their lives as isolated cells, but come together when a chemical signal is released. Then together, they form a multicellular organism which reproduces and makes spores. So they are both single-celled and multicellular. That is not all: the multicellular form loses its cell walls, and becomes a syncytium. This is an organism with many nuclei, but few or no cell walls. The single cells are amoeboid (amoeba-like) and haploid (one set of chromosomes, like our gametes). The multi-nuclear stage is called a plasmodium. It is diploid, formed from fusions between pairs of amoeboid cells. It gains nutrition by phagocytosing bacteria and food particles. As the food supply fades, the plasmodium makes haploid cells by meiosis, and they form the basis of spores. The spores are kept and then distributed from a structure like a sporangium. This life-cycle is typical of the main group called Mycetozoa. Modern molecular biology has shown by sequence analysis that slime molds are not a monophyletic group. They were once regarded as fungi, but now they are split into three different groups, and none of them are fungi. Relationships between the groups are not yet understood. Bikonts are eukaryote cells with two flagellae. There are three groups, which have evolved slime mold form independently. Acrasidae: slime molds which belong to the super group Excavata. Labyrinthulomycetes: slime nets which belong to the super group Chromalveolata. They are marine and form labyrinthine networks of tubes in which amoeba without pseudopods can travel. Phytomyxea: parasitic protists which belong to the super group Rhizaria. They also form cells with more than one nucleus, and are internal parasites of plants (e.g. Club root disease of cabbages). Myxogastria: syncytial or plasmodial slime molds, the most commonly encountered. A common slime mold which forms tiny brown tufts on rotting logs is Stemonitis. 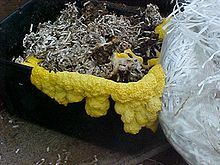 Another form which lives in rotting logs and is often used in research is Physarum polycephalum. In logs it has the appearance of a slimy web-work of yellow threads, up to a few feet in size. Fuligo forms yellow crusts in mulch. Dictyosteliida: unicellular slime molds or dictyostelids. The Dictyosteliida, cellular slime molds, are distantly related to the plasmodial slime molds and have a very different lifestyle. Their amoebae do not form huge coenocytes, and remain individual. They live in similar habitats and feed on microorganisms. When food runs out and they are ready to form sporangia, they do something radically different. They release signal molecules into their environment, by which they find each other and create swarms. These amoeba then join up into a tiny multicellular slug-like coordinated creature, which crawls to an open lit place and grows into a fruiting body. Some of the amoebae become spores to begin the next generation, but some of the amoebae sacrifice themselves to become a dead stalk, lifting the spores up into the air. Protostelids. The Protostelids have characters intermediate between the previous two groups, but they are much smaller, the fruiting bodies only forming one to a few spores. Fonticula is a cellular slime mold which forms a fruiting body in a volcano shape. Fonticula is not closely related to either the Dictyosteliida or the Acrasidae. A 2009 paper finds it to be related to Nuclearia, which in turn is related to fungi. ↑ deBary, Anton 1858. Ueber die Myxomyceten. Botanische Zeitung, 16, 357–358, 361–364, 365–369. ↑ "Introduction to the "Slime Molds"". Retrieved 2009-04-04. ↑ Sometimes called Myxomycetes in older literature (they are not fungi). Bonner, John Tyler 1959. The cellular slime moulds: investigations in the biological sciences. Princeton University Press, Princeton N.J.
Bonner, John Tyler 2009. The social amoebae: the biology of cellular slime molds. Princeton University Press, Princeton N.J. This page was last changed on 22 November 2018, at 01:43.